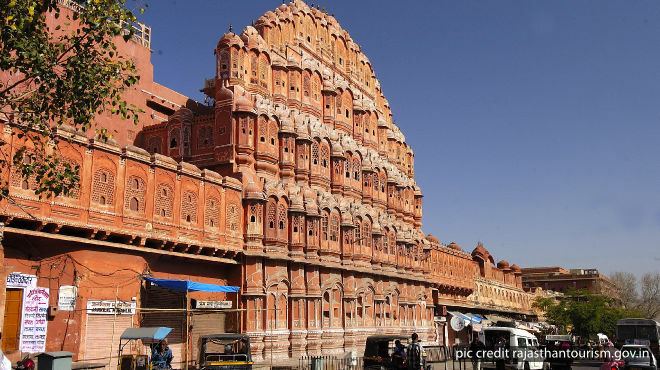 Just as vibrant as every other Rajasthani city or town, Jaipur puts on a spectacular show with her royal palaces and forts, culture and cuisine, festivals and folk artistry, handicrafts, and signature hospitality. Jaipur is also a treasure trove of traditional jewellery, textiles, leather goods, brass work and other hand-crafted goodies that have an irresistible lure. So be warned! This former princely state, once ruled by the Kucchwaha Rajputs, ranks among the oldest pre-modern planned cities in India and was founded by Maharaja Jai Singh II in 1727, when he shifted the capital from Amber Fort 11 km north of the city. Interestingly, the city was designed and planned by a Bengali architect, in grid-like fashion, according to Vedic principles. Its sobriquet, the ‘Pink City’ came much later, in the 19th century, when it was painted pink to welcome the then Prince of Wales. Just because it’s the capital of Rajasthan doesn’t make it a sprawling urban agglomeration. Jaipur is fairly small, even though many of the villages on its outskirts are now developing, and it is easy to cover its length and breadth in an autorickshaw. Situated in the north-east of Rajasthan, Jaipur is part of the Golden Triangle encompassing Delhi – Agra – Jaipur. If you’re touring Rajasthan exclusively, it is a good starting point for an itinerary that includes Jaipur – Jodhpur – Jaisalmer.